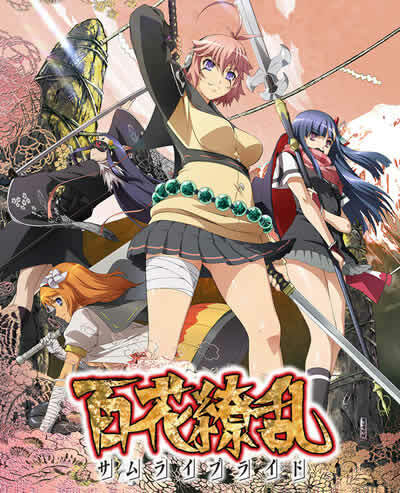 The 2nd season of Hyakka Ryouran Samurai Girls, Samurai Bride follows Muneakira, Jubei and the rest of Muneakira’s harem as they face the new threat of four resurrected Dark Samurais and evil spirits that hate the Tokugawa shogunate. And they also have to run a maid cafe while they are at it. The first season of Hyakka Ryouran started off well, but slowed down in the middle and didn’t quite pull itself together for the final battle. This second season was unfortunately even worse, since it didn’t start off well to begin with. The four rival Dark Samurai girls show up, but for the first couple of episodes Muneakira and the girls are more concerned about keeping their maid cafe venture afloat rather than thinking about ways to fight new threat. Or course, Hyakka Ryouran is a very fan-service focused show, and I suppose we don’t really watch shows like this for the story, but I’m expecting something a little better than… say… what Queen’s Blade offers. It just took the show a little long to actually get to the point. The only thing I liked about the story is that finally all the girls in Muneakira’s harem are Master Samurais, and so they don’t have to sit by and let Jubei, Senhime and Yukimura hog all the glory. The harem also now includes Yukimura’s monkey Sasuke which was one of the funnier parts of the show. Hyakka Ryouran is known for its inky art style that can look quite pretty when the show decides to put some proper animation into the scenes, but a lot of the fight scenes were short or were just lights flying and colliding in the sky. Even in some of the non-action scenes there was some sloppy animation and drawings. The final showdown was longer but again consisted a lot of lights streaking and colliding in the sky, but it was funny that the Samurai Bride Jubei ended up getting dog ears. Overall, Samurai Bride was nothing to write home about. Production quality is so-so, and the pacing of the story is pretty bad. On the upside, the girls are still pretty; there’s plenty of fan service; the action can be good some of the time; and sometimes the comedy is amusing. Certainly not a good show, but probably not bad enough to stop me from watching the next season of the show.